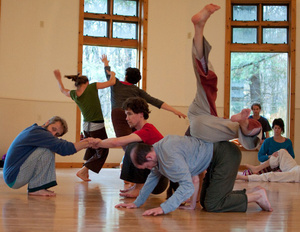 Every 4th Sunday of the month, the dance floor becomes a learning lab for Contact Improvisation. Old- and new-timers discover the form together with a class that leads easefully into a jam. All dance levels and styles are welcome! *This month's "4th Sunday" Class & Jam will take place on the second Sunday of the month and will be led by Lalitaraja, a participant in Nancy Stark Smith's January Workshop. This workshop focuses on mindful states of being and explores the gap between stimulus and response in our dancing. We will consider how to bring attention into the gaps between things - between one breath and the next, between impulse and surrender and between fall and recovery. In open dancing we will look at the changes that take place in our dancing all the time and give ourselves small pauses in order to read the dance that we are in, in order to find its riches.